Follow-up on stretch passes, the Maple Leafs use of them and why it's still a great exit strategy. - The Point Data-driven hockey storytelling that gets right to the point. Follow-up on stretch passes, the Maple Leafs use of them and why it’s still a great exit strategy. Read through ‘Maple Leafs Twitter’ and it won’t take you long to find a number of people complaining about the way the Leafs exit the defensive zone. Complaints about bad stretch-passes are commonplace and yes, when a long pass out of the D-zone gets picked off or goes for an icing, it does look ugly. 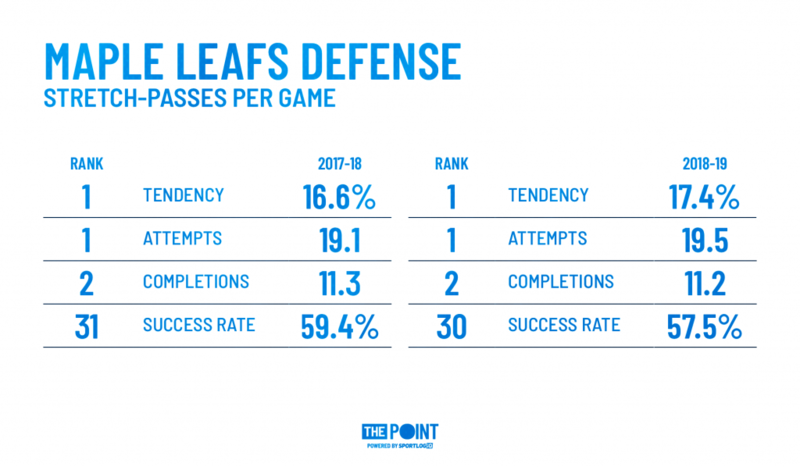 But there’s a method to the Maple Leafs madness and when one accounts for all of the stretch-passes they make, it’s clear why the Leafs continue to rely so heavily on them. 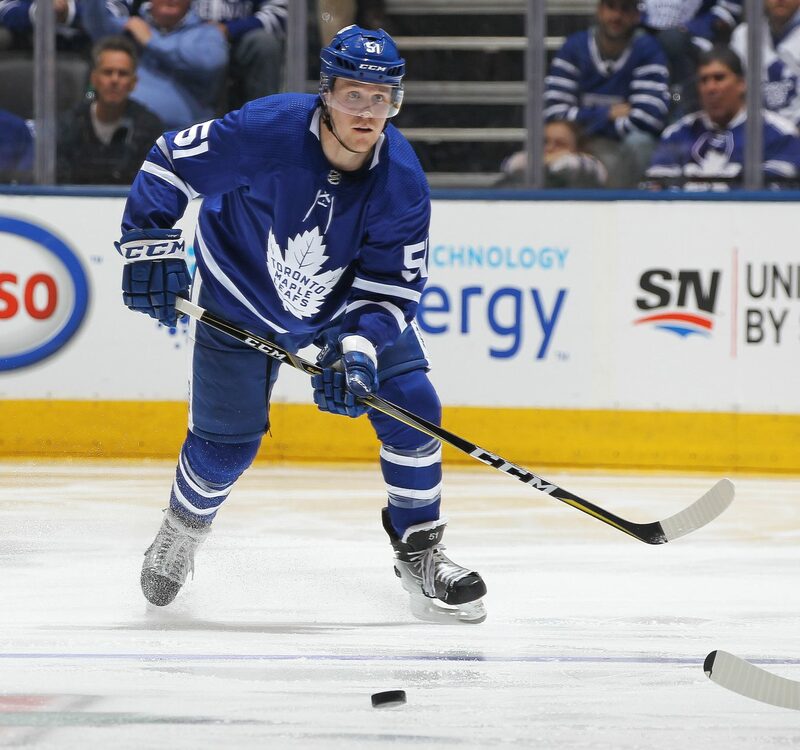 In September, I wrote an article about the value of stretch-passes in general and more specifically, the Maple Leafs penchant for using them despite their remarkably low success rate. In researching that article, I determined the reward of a completed stretch-pass (a pass from the defensive zone to beyond the red line) far outweighs the risk of an incompletion, therefore, it really doesn’t matter if a team fails on a high number of its attempts. I explained why here and likened it to baseball where more and more, batters are taking a power over average approach. A) The Maple Leafs are employing the same breakout strategy as last season. C) If, league-wide, the reward still vastly outweighs the risk. Like last season, Toronto’s completion rate is very low relative to other teams in the league. However, the only number that matters here is the number of completions and, once again, the Maple Leafs rank 2nd in the NHL. One argument I made in my September article was, given how often the Maple Leafs attempt stretch-passes, they should rely more on Travis Dermott in this area as he had the best completion rate of any Toronto defender last season. 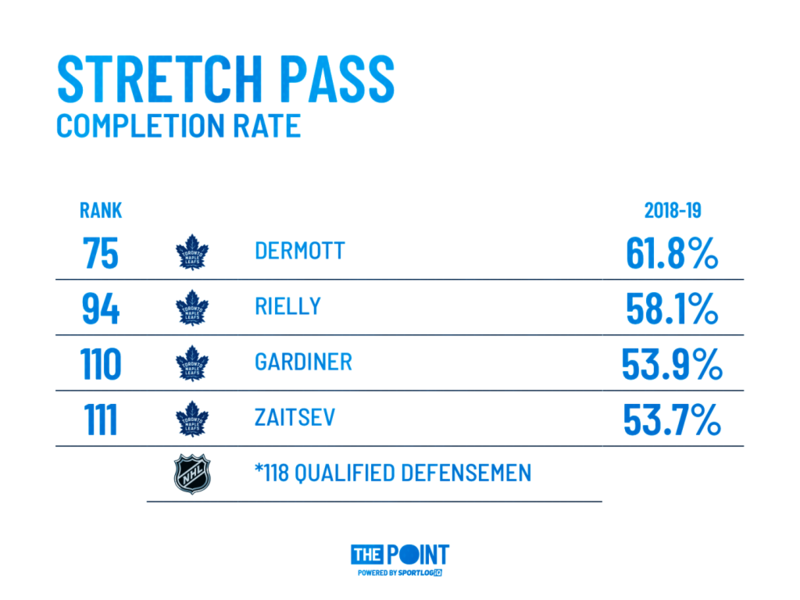 Once again, Dermott has been the Leafs best defenseman at completing stretch-passes this season. Jake Gardiner, who is once again top 5 in the league attempting stretch-passes, ranks amongst the worst defensemen in the league completing them. In fact, of 118 defensemen who have attempted at least 30 stretch-passes this season, Gardiner and Nikita Zaitsev both rank in the bottom 10. As I said, not a huge deal given how unlikely it is for an incomplete pass to come back to bite you but why not lean a little heavier on the guy who continues to prove he’s your best option in this facet of the game. Anyways, back to the whole risk vs reward thing. In measuring what happens within 10 seconds of a completion or an incompletion, we can see exactly how vastly the reward of a completed stretch-pass outweighs the risk on an incompletion. Last season, Toronto created scoring chances at a 9:1 ratio off completions relative to what they gave up off incompletions. This season, the Leafs have created 34 scoring chances within 10 seconds of a completed stretch-pass and allowed just 2 off an incompletion. Not pretty but again, it’s important to remember the reward of a completed stretch-pass currently outweighs the risk of an incompletion by a more than a 7:1 ratio league-wide in terms of scoring chances, and by a 32:1 ratio in terms of goals scored. The other caveat to all of this that you’re likely wondering is, what about when the Leafs, or any other team for that matter, misses a stretch-pass and it goes for an icing? Shouldn’t that be factored into this discussion on the negative side of the ledger? Good question, but again, ultimately it doesn’t matter. The Leafs have iced the puck a league-high 29 times as a result of missed stretch-passes. Following the ensuing 29 defensive zone face-offs, Toronto has allowed a total of 3 scoring chances and zero goals before successfully clearing the puck out of the zone. League-wide, only 6 goals have been scored off stretch-pass related icings, using our aforementioned criteria of a goal being scored before the defending team is able to get the puck out after the face-off. Hardly a reason to pull back on the amount of stretch-pass attempts a team makes. To summarize, the stretch-pass continues to be an effective way of generating offense, especially if a team has speed on the wing, which the Maple Leafs do. Incompletions and icings are white noise and a high number of completions is all important, regardless of success rate. So, while it may be tempting to pick apart the rare incompletion that comes back the other way, be sure to note each time a stretch-pass generates a quality chance or a goal for that matter because from what I’ve determined, there continues to be a lot more reward than risk when it comes to this defensive zone breakout tactic.